Sandwich Camouflage: Spoiled food = foiled thief? 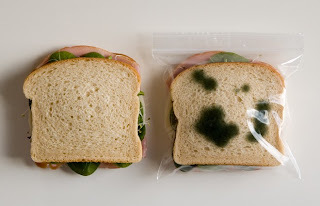 These Anti-Theft Lunch Bags practice security by deception rather than force: each bag is printed with green splotchy spots, making it look like the sandwich inside is a moldy mess. I've posted about a similar technique - making your bike look ugly to deter theft - but this one's a bit different. Even though both an uglified bike and an uglified sandwich work, one is decidedly less appetizing. So, is that the problem with this design? The possibility that even the user who knows the secret is turned off by the illusion? Maybe. But personally, I'm not about to find out. Good idea, but you could be risking someone simply throwing out your sandwich because it looks moldy, which would defeat the purpose.